So pures have to have a hybrid alt for this one? QQ! Time to stack bandages, the healing skills of my hunter won't go unnoticed! Hunters and Warlocks rejoice! Your pet tanking skills can be proven. Perhaps this achievement can be given a second rank (gold) that will once again enable your pets taunt work on raid bosses. Brb, tanking as a shaman and a mage. This could actually be alot of fun to try for, just to see if you can do X as Y! Finally I will get a chance to try out my Charred Glyph. Then maybe I can pug for rares around Pandaria and actually do some tanking. EDIT: Goodbye, Glyph of Demon Hunting. You will be sorely missed. CELESTALON AND OTHERS, LET US TANK! I find that some of these criteria's may be easier for some classes than others (such as universal classes like Monk or Druid) but remember, it's called the proving grounds for a reason, so don't be afraid to challenge yourself and take a harder route! I wish good luck to all those who want to obtain this achievement come Patch 5.4., Happy 'chiev-hunting! Just tried to do this on the PTR on my mage, in 530 gear. Couldn't even get past bronze tank wave four. I can see this is going to be very challenging, and also extremely fun to do on the live servers. So far on the PTR I can choose the healer and tank challenges as a mage, but I don't know if that will be restricted when it goes live. It looks like during the tank challenges, the healer NPC does more damage than me, but only if there is nothing to heal, so the goal as a mage might be to slow the adds down as much as possible, so she can kill them for me. Might work out better as frost. Look out world! Tigerskin, the Orc Hunter, is about to become Tigerskin, the Proven Healer! Obviously this achievement is easiest as a hybrid. For starters, I do not recommend trying the tank trial as a DPS because the mobs have 3M+ HP and there are many of them, so with gear scaled down to 463 they are not easy to burn down (and boy, do they pack a punch!). For the pure classes, I would say that rogues and mages would find this achievement difficult; hunters and warlocks are not only pet classes but have tools that would allow them to do the other challenges. If you are a hybrid class, I would recommend doing the DPS challenge as a tank or healer because the health pools of the mobs seem manageable and they don't fight back - allowing you to focus on your job. I was able to complete this achievement as a blood death knight doing the DPS challenge. I did not have any special reforges, but I recommend taking gear with a bias towards crit and haste, as for most specs these are a DPS increase. Remember to utilize all of the tools available to your class: use executes, DoTs, and debuffs if you got them, and use your DPS cooldowns as needed but save the ones with long cooldowns for the final waves. Since the mobs do not attack, taunts, CC, and big heals are not required, so replace them on your bars with damage talents. Good luck! It is not too hard to do with Demon Hunting Glyph. I would reccomend taking the Harvest Life Talent, as well as the Drain Life Glyph. My pet was the Voidwalker, because i wanted to have a second Taunt. Though i didn't need it, so i would choose the Felguard next time for better AE damage and a stun. Generally it is a good Tip to try to kite the Mantid Mobs, as they hit like Trucks and you do not have to kill anything in this challenge you just have to make sure both you and the Monk in the center survive. Another tip is to sleep (the alternative to Fear in Demon Hunter Form) the Mantids. as long as the Monk isn't castin AE Crackling Jade Lightning. Don't forget to kick the caster Mobs with your Carrion Swarm, too. And last but not least use your Felguards Axe Toss to stun Mobs that are dangerous. After some tries I'm sure anyone can do this! Tried this with my Warlock. Bronze was very easy with Voidwalker and Destro Specc. Silver was impossible with this combination - though i managed to get to wave 8/8 with Demo and Tanking glyph. But in about 10-20 tries i never managed to survive this last wave. But I'm sure it is possible with luck or maybe another tactic. Any advice on getting this is obviously going to be quite class specific. Here's my perspective as a Resto druid with a semi-decent Feral offspec. I tried for a few hours to do the DPS Silver as Resto, using cat form (swapping to a Feral polearm) for Rake and caster form for Hurricane. It didn't go very well: I didn't have enough single-target DPS to bring down the Mystic in Wave 5, and I finally gave up. I didn't go as far as gemming/reforging out my spirit and mastery, but I'm not sure it would have made the difference. I had more success changing my Feral spec to Guardian and wearing my Feral gear. My basic single-target rotation was to go cat form, Rake, Mangle, Mangle, swap to bear form, Thrash, Mangle/Maul/Swipe, then swap back to cat when my energy has recharged. And for AoEing down the little guys, cat Thrash + bear Thrash + bear Swipe would do the trick. Waves with amber are easier since you can make use of the 50% damage buff on frozen enemies. Wave 5, which doesn't have amber, is probably the trickiest. For Waves 7 and 8, of course, you can just use Heart of the Wild with 20 seconds to go on Wave 7 and the rest is easy. Note that flasks and food work in the scenario but potions don't, so you won't be able to pot through a difficult wave. I found this quite difficult, but it might just be because I'm bad at DPS. :) Good luck! I am currently doing Dps (Gold). I didn't notice in till I started gold that my items were being SCALED DOWN to 463 like they are in CHALLENGE MODE. After a lot of tries i managed to complete it as a retri paladin doing the silver tank mode. Probably going to get this as a Discipline Priest. Disc is technically a healing spec, but does crazy-awesome damage if you spec it right. The easiest way is probably doing the DPS Challenge as Blood Deathknight. Out of the 5 tanking classes, Blood DK's are doing the most damage without vengance. As DK I could finish most waves with 15-20seconds left. On the last wave I did use Army of the Dead and even had 39 (!) seconds left. * Start every Wave with spreading diseases first. * Use Dancing Runeweapon (every 2nd Wave). * Use Remorseless Winter to stun the Defenders. * Use Strength Food & Strength Flask. * Use Icebound if you get stunned. * Use Army of the Dead (Wave7 looked as the hardest). 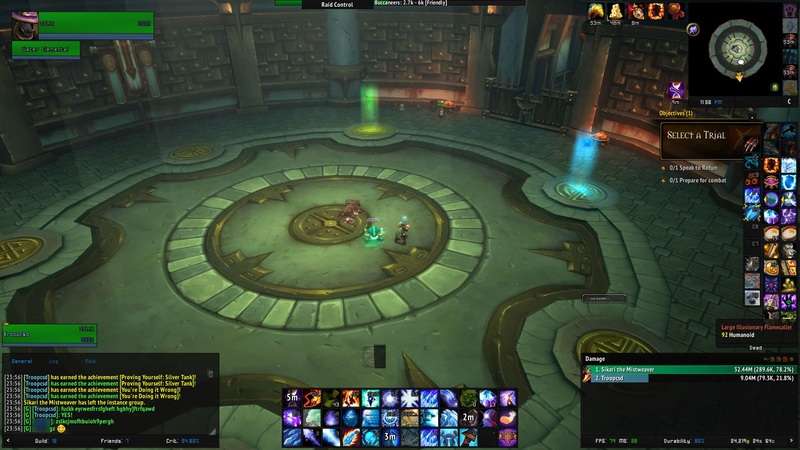 I can confirm this is possible as Holy Priest doing the DPS silver mode, using Chastise Chakra. To do this I grabbed my old shadow gear and reforged any spirit/mastery to haste and crit (both Spirit and Mastery are absolutely useless for this, unless you are going oom which you shouldn't with Solace) and gemmed haste/intellect. I found it best to dot as much as possible with shadow word: pain, make the most of your solace (or holy fire) debuff by smiting that target. Concentrate on anything that gets hit by amber, even if it's the ambershaper (to get it low) but try to kill those ones last. Halo for the rodent packs. Holy word: chastise to stop the healers from casting. You can drink in between waves if you have time. The rest really is just practice. Did this today as a Mistweaver monk doing Damage. It was VERY simple. Bronze was very simple and didn't require me to do much, just use melee abilities in my healing stance. Bring some mana food for when you have some time to drink. Mana is NOT a problem here. The only time I had mana problems was on wave 8 silver, but I had about 15 mana tea stacks from previous rounds (because I drank in-between) so I just used them. Tactics: Use Jab, Tiger Palm and Blackout Kick (or attacking abilities for other classes) while killing targets that are not grouped up. When lots of adds spawn together, use Jab then Blackout kick for some aoe, Chi Burst or Chi Wave, you can also use Spinning Crane Kick at times. If you're running low on time with one add left, don't be afraid to use Touch of Death. When the adds spawn that shoot Amber at you, kite it over another add which will make you deal 50% more damage to them for a short duration. Interrupt the healing adds. My kill order was Healers>Ambers>Adds to Aoe>Single target do nothing add. I didn't use a flask (I actually did it on my first try of silver) and some 200 haste food I bought from the vendor. Talents: Celerity, Zen Sphere (Didn't really use this, you can go for one of the other two if it suits your playstyle. ), Ascension, Leg Sweep (For the adds that use shield) Healing Elixirs (Yes I know you don't need to heal here, but it was my first try that I got it on and didn't know what to do, so Diffuse Magic is the best I suppose.) and Invoke Xuen, the White Tiger. You will probably need Xuen for the last wave unless you're very good. If I missed anything out write below and I'll edit it in. bandage and spirit mend npc between each wave. Did Tank as resto shaman the other day. Got stuck on the 5th and 6th wave way too many times. The rabbits with the bleed are the most annoying. Made it to 5570 on endless with the same setup. IMO forget about GHW. Riptide, unleash elements and healing surge instead and pray it crits. Completed the tanking challenge as a resto shaman. Much like the healing challenge you need smart CD management, CC, mana conservation and hefty healing. Hex the highest dps add and AoE stun the little adds, heal like crazy and divy up your healing CDs to deal with each wave and it's completely doable. I'm also missing like 7 sockets and my professions are Herb/Inscr. You also get to drink twice, don't forget drinks! - This is going to be very tricky. Don't get discouraged. Settle in for the long haul. I strongly suggest food and a flask. - You're not a DPS anymore. Your job is not to try to kill all the things. You're a tank. Sikari is your DPS. Even knowing this intellectually, you may find your DPS instincts taking over now and again; do your best to overcome them. - Since your gear is all scaled down to 463, your DPS is going to be much worse than usual. This means that you can't just try to face-aggro everything. Sikari is better at face-aggroing than you are, trust me. Look through your spellbook for any taunts you may have forgotten about, as well as any slows, stuns, roots, fears or other CC. Defensive cooldowns, too. - Adds only ever spawn from two points, the circles on the ground closest to the gate. Put a world marker on each of these spawn points. Because it's so easy to get turned around in that room, this will be vital to helping you remember where each consecutive wave is going to spawn and prepare accordingly. - If you can't pick up aggro on mobs outright, do your very best to delay them from getting to Sikari, and hope she kills them before they do. On packs of 4 mobs or more, she uses an AoE lightning, and on packs of 3 or less, she single-targets whichever mob has the least health, meaning that if you're quick on the draw, you can partially influence what she will attack first. - Sikari's only heal is a HoT. Admittedly a pretty powerful one, but still. If you have some breathing time between waves, heal or bandage yourself and her. - I did this with Glyph of Animal Bond, Glyph of Misdirection and Glyph of Mending. Glyph of Distracting Shot would also be useful, but I didn't realize I had it until after I'd already completed the challenge. - As for talents, Narrow Escape and Binding Shot are really valuable for trapping things in place right after they spawn. I took Spirit Bond because I didn't know if my usual standby, Iron Hawk, applied to my pet as well. I used Dire Beast on CD, though any of the level 60 talents are fine. Lynx Rush and Glaive Toss are good for dealing with packs of virmen. - Use your favorite tank pet, and make sure that Growl and Thunderstomp are on (you may have turned one or both off at some point in the past). - Pre-drop every trap you've got on each spawn point, and wait on top of it. Disengage as soon as anything spawns, so that the web trap from Narrow Escape kicks in. Misdirect and Multishot like crazy to establish initial aggro, and keep Mend Pet up at all times. If anything gets past you, slow them down with Concussive Shot, Binding Shot, or Scatter Shot. If mobs stick onto Sikari, chain Distracting Shot until all of them peel off onto you. - Interrupt casters as you can. - Laugh at the wind mantid guy. Your pet doesn't care about knockbacks. Good luck with this achievement! It makes for great bragging rights. You may be doing it wrong, but it's oh so right. Save White Tiger for Wave 5 and 7/8 , and if you can sneak a amber orb from 7 into 8 it really helps. Also agi flask , crit food and if you have it the Agi Legendary cloak. Even a taunt barrel at the start to put the debuff for Breath of Fire, does helps on the harder waves 4 5 and 7 and do use Deathblow on the Healers . they just have to much HP not to use it on them, and Dual Wield weapons did help for me . Very easy to do the tank challenge as restoration druid. Just pop CDs to heal through the small adds and taunt the Wing-Guard and then root him - you can spam Entangling roots, there is no diminishing return. Just did the silver damage one as a holy paladin, was pretty easy. Light's hammer for the waves with all the small mobs. The most lacking part of "holy dps" is aoe, so Light's Hammer is the best you've got. I tried with Holy Prism on myself as an aoe, but it wasn't strong enough to be significant. Failed once due to not having Light's hammer, and wasted too much time single targeting the small mobs. Once I picked Light's Hammer, it was a cake walk. Completed this today on my Blood DK doing the DPS challenge. I just used my Frost set, which was already reforged to haste/crit. I used the strength flask and buff food. I had to do some additional reforging on the gear to bring my hit/expertise cap back up after being scaled down to 463. I found that the runic power regeneration from Frost presence was a little better than the haste buff from unholy, although I initially thought it would be the other way around. It took me about 8-10 attempts to get everything down. I pre-casted Death and Decay a second or two before the pulls that had the small AoE adds, and immediately spread disease across them before heading to the bigger mobs. On fights that there was a central mob and several on the outside, I would dps the central mob while moving alone the outside, Bloodboiling (with rolling blood) to spread it to the outside mobs before switching targets. Generally, I would get a target to 35% health, cast Soul Reaper, and then immediately switch to another target and let my diseases and Reaper finish it off. I saved the minion for the 7th wave, and used Army on the 8th wave. Like the other classes, the important thing to remember for this achievement is to interrupt the healing mobs and to make sure to kite the amber balls into other mobs as well. I found a good strategy for this was to wait on the opposite side of one of the amber mobs right when they were about to cast the ball, and then rotate 180 degrees around them, so the ball runs straight back into them. This works especially well on the 8th wave where there are two amber mobs - one of the orbs will stun the healer mob, and the other amber mob will stun himself, if you play it correctly. On the 8th wave (and the 7th too, on another run) I was able to get caught in one of the traps and still complete it, but time was tighter at the end. There is no second achievement for doing this at a Gold rank. I knocked out the DPS Gold as a disc priest with a CM set high on crit and 2k spirit and didn't get any further rank of the achievement. I managed to do it today as restoration shaman, followed the tips from Kjarlot and Jarzo. Someone said that the 8th wave was easy but in my experience i found it to be the hardest, maybe it has been changed since those coments though. I used fire elemental on 6th wave, send it to attack the big wind lord while i hexed the other add. I felt the best way to use the earth elemental was on the last wave. As a hunter I tried for about an hour as beast mastery (seemed like the obvious choice to me) to no avail and then switched to survival and oneshot it. I can't state enough how good Serpent Spread is on this challenge. Beast Cleave simply can't keep up with the monks aggro and this fight is 90% aggro management and 10% survial/cc. On wave 2 as BM the healer usually dropped below 30% due to aggro from everything and as SV they simply stuck to my pet like glue. The only problem I had was with the large adds, they hit like trucks. I always sent my pet to attack them first and after that the monk seemed to target them first as well. You'll also want to manually use cower and shield wall one after another and then use stuns to keep them from killing you pet. If it dies anyway (happened to me) use Distracting Shot on the large add (the healer will survive the smaller ones for a while, but the large one will kill her quickly), Deterrence and rez your pet. Finally, if you use glyphed Distracting Shot make sure to also switch your pet to that target for a few seconds to get a real taunt and a few hits in, the shot alone won't do the trick for long. I hope this turns back to a Feats of Strength Achievement. Wondering why it says 10 points now. After at least a dozen attempts doing Tank as Resto, I tried Healer as Balance and got it in one attempt. You really just spam HT and Astral Communication for mana between waves. Had to use HoTW on wave 6, but 7/8 were fairly easy. Yaungol Wind Chime and Terracotta Fragment are great here. The Terracota guardian spams mocking blast as long as it lives and if you´re a bit careful, he will survive till the end. With the hot from Sikari he can tank any add except the mantids in waves 6-8 silver, which you need to kite yourself. You can´t really controll what he will do though, except that on start of every wave, he will go for the first add that you attack, so you need to put your first bomb on the thing you want to kill last. Done in a handful of tries as a Mistweaver in the DPS but I wore Windwalker gear and stayed in Stance of the Fierce Tiger the whole time. Stuffed a blue 463 off-hand in my... uh... off-hand. Only important talents are Chi Wave, Chi Brew and Invoke Xuen. Chi Wave on a target in Amber does a lot of damage. 5 and 7 were the toughest. Don't use Touch of Death unless you REALLY NEED IT. Delay Chi Wave and Chi Brew charges for when Amber hits. Watch your Tiger Power buff. If you have more than 5 secs left in the round and you've beaten it already, build some Chi for next round with Expel Harm. Keep Amber-Weavers alive as long as possible. Wave 2) Also easy, just spam spinning crane kick. Stop to use BOK or Tiger Palm for the debuff and to dump chi. Wave 3) Kill the slayers first, drag the orb into them. Wave 4) AoE, pretty easy. Wave 5) It starts to get a little tricky here. I have to save Touch of Death for this and use it as soon as humanely possible on the Mystic, then AoE the rest down. Chi Brew x 2 for maximum damage. Wave 6) Invoke Xuen and attack+interrupt the healer. Xuen lightning cleaves onto the others so the Slayer should virtually be dead without actually touching it. Wave 7) Kill Mystic, get globes onto it. Go to the Guardians and stay at a position so the amber weaver's blobs won't get soaked by the virmen. Wave 8) Several ways to do this. I nuked the mystic and used the orbs on it, as well as Nimble Brewing out of the stun if I got hit. If you can't help yourself from getting hit twice and aren't a Human for the racial stun breaker, just kill a weaver first and paralyze the mystic. Mystic > Weaver > Slayer > Weaver was how I did it, but you can also do Paralyze Mystic > Weaver > Mystic > Slayer > Weaver probably. Touch of Death is up again, and Xuen is up in the last 6 or so seconds so squeeze out as much damage as you can. Easiest way to do this as a druid is to dps in guardian. No flask, no reforging, couldn't even use heart of the wild right because the cat form bars weren't set up (lol) still got it. Just did DPS as discipline priest. Wasn't too hard, but it took a few tries to get certain things right. My priority went crit > haste > spirit, since mastery does nothing for DPS. If you have it, I also suggest switching out your helm at least for a better meta gem, but it's not necessary and I did it with the legendary healer meta equipped. - I drank after every wave when I could, even if I had a lot of mana, just to prevent the possibility of OoMing. - Remember that mobs CAN be feared, so psychic scream can be used to interrupt the healers, and psyfiend might be able to be used as well (though much less reliable). - Fairly obvious, but it took a bit of training myself because I'm so used to doing it for healing, but do NOT consume your stacks of evangelism. It increases your damage, so this is very important. Just did the tank challenge as a Survival Hunter. Some tips I can give are to go with Binding Shot to stun the small adds and Fervor for some burst aoe threat on them. Asides from that don't rely on Ice Trap too much to remove mobs from combat as the healer NPC will usually break it. The fire that the add puts on the ground will hurt you but won't hurt your pet so I would always have my pet stand in it to get some extra damage on the mobs. You can counter shot both of the fire adds as well so they will run into the fire. If you can time it well you can counter shot the larger of the fire adds (sorry I don't remember names) so they run forward into the fire the scatter shot and arcane shot them so they stop and stand in it. Completed today as a blood DK in pvp gear doing the damage one. Was as simple as; do it a few times, wipe, learn where the mobs spawn/what they are and basically know the class/spec you are playing. Talents used were: psyfiend, body and soul (doesnt really matter, feathers may have been more useful), mind bender, angelic bulwark (doesnt matter), twist of fate and divine star. I reforged mastery to crit and spirit to crit/haste to get the most burst dmg. Mastery has no use for damage. The mystics were the most annoying as a disc priest has no "interrupts". I made use of psychic scream and psyfiend, but a few heals got off. I always divine star'd so it would hit the maximum mobs on the start of the wave and on CD. Use the amber shapers to freeze one of the adds (mystic and other amber shapers are good targets) and blow it up. Mind bender on the harder waves, I think I used it on wave 4, 6, 8? Whichever had lots of big adds and mystics and/or lacked an ambershaper for that burst dmg. Good luck and have fun :) Took me about an hour to figure out talents and strategy before I finally got it. I was flasked for int and had 300 int food buff. Whenever you get an elite + aoe pack, single target the elite but then swap back to the aoe pack everytime Keg Smash comes off cooldown, then swap back to the elite (all the while, keep up Rushing Jade Wind). Make sure Dizzying Haze is applied before using Breath of Fire and only use it for the small aoe packs. Always be in melee range of whatever you cast Chi Wave on so you lessen the travel time. I did not have to use Touch of Death, so I recommend glyphing it and keeping it in reserve to use when you are at 2 sec left on the clock and nowhere near killing the last guy of the wave (dont forget to use fortifying brew first!). Whenever you are ahead on time, build up chi so you have 5 chi ready for the next wave. -Keep Tiger Palm buff up. You should be able to get in 2 Palms for every Keg Smash you do without repercussion. I use a macro for this that I spam to conserve space on my bars. The first is for non-engineers and the second is for engineers with the glove tinker. I did the Silver Tank Challenge as a Ret Pally. I stuck with my haste/mastery Prot gear. I also used stam flask and food. T1-Speed of Light-For those whoop whoop whoop whoop whoop moments. T2-Fist of Justice-To stun Windguards and Flamecallers more often. T3-Eternal Flame-The HoT is nice and unlike SS, I can use it on Sikari in addition to myself. T4-Unbreakable Spirit-I also tried Hand of Purity but succeeded with US. T5-I used Holy Avenger to help burst down Windguards and AoE packs. T6-Holy Prism-For burst healing for myself or Sikari. Glyph of Divine Protection-For physical damage reduction. Glyph of Templar`s Verdict-For a 10% damage reduction after using Templar`s Verdict/Exorcism. Maintain your 10% damage reduction buff by using Templar`s Verdict and Exorcism. Stun the Windguards as often as possible. Let the Flamecallers cast their lava and pull mobs into it. Interrupt their single target spells. If you cannot interrupt them, LoS them or use Devotion Aura. Save Blinding Light for large AoE packs, especially the final trash wave. You can use Speed of Light after using the stun to create some distance between you and the mobs. You can bubble off the Chomp debuff from the Vermin. You can create some breathing room with no incoming damage to yourself or Sikari by bubbling yourself then BoPing Sikari. This was handy on the final wave. Do not be afraid to let Sikari tank a mob every now and then. You can reduce her damage taken with Hand of Sacrifice and heal her with EF. The real challenge here is knowing how much damage you can take and when you should use cooldowns. Took me 2 tries to get the silver tank challenge done as Unholy. I sat in blood presence and kept conversion running when I started taking damage while keeping dots up on everything. Soul reaper is fantastic to get your runes recharging between rounds and during fights with lots of adds. Most of it really wasn't that bad. the main guys that hurt are the large wind guards which come out in the later rounds, it is very helpful to use the asphyxiate and pet stuns on these, you may even need to use death strike along with conversion to get your health up. use the fires if you can to dunk your enemies in it (death gripping the caster after it's done making puddles is very helpful), it will really help getting them down, but be careful and make sure you AMS just to be safe. At the very end of wave 7 with about 5-6 seconds left you are going to want to stun the wind guard if it's still up and start channeling your army, pop empower if you need it because army is going to make the final wave a lot easier. Final wave swap to unholy presence pop gargoyle and everything make sure to get stuff down quickly during your army, in particular the big guy while rotting the others down with dots. Hope this helps. GL on the achieve! After trying this with various comps - surv hunter tanking, ele sham healing, I got it on my blood death knight in my unholy gear! Very easy if you spread diseases and make a lot of use of the amber from the amber weavers. Icebound fortitude if you get stuck in an amber by accident and you'll have it! Completed this as a hunter today on Tank mode. Had my pet tank and I used glyph of misdirection. Took about 3 tries. Just did this as a elemental shaman, Make sure you have rockbiter weapon and unleash elements on your bar and you heal the npc with surge at every single free moment you have. it's all about using your capacitor totem at the right moments, thunderstorm and hexing. Up to wave 5 and 6 you should have no problem if you make sure to cap totem when they're grouped up and spam chain lightning and just before the debuff ends thunderstorm them away. Ancestral guidance is also extremely helpful in the waves with large numbers of adds as it tops both you and your npc friend up. If you're getting dangerously low and any point pop either shamanistic rage or astral shift and/or a healthstone. Where it really gets hard is on the last 3 rounds where the windreavers show up, on round 6 hex the small add that comes along with the wind reaver and then instantly taunt him and drag him back a bit. You will need to pop a defensive at this point and your cap totem/thunderstorm may be on cooldown so it's better to just wait for him to drop aggro and then use your taunt again. This time you should be able to use a cap totem if he is above half hp and you can also use your 2nd defensive if it's needed. After he dies and the hexed add is also dead this is where it gets tricky, you want to instantly hex the new wind reaver taunt the big add and interrupt the lava throwing add and quickly try to get aggro on him. If you get unlucky the hexed wind reaver will walk into the lava and drop hex meaning you will have to instantly pop earth elemental. But if not just take out both the other adds, try to drag the wind reaver into the lava after they die and use your earth elemental as soon as the wave is about to tick over even if you haven't killed all the adds yet. The final wave just pop EVERYTHING and spam lava beam, cap totem when they all group up and try to make sure you still have Ancestral Guidance as it's extremely useful in making sure she doesn't die. Your earth elemental should pick up a lot of the slack but make sure a defensive is up when you start the burst or you could die very quick. All you need to take care of now if the pyroblast add along with a small add that spawns in the back around halfway through the wave. If you manage to get aggro on them and your earth elemental is still up you should be fine, and even if it's not up just do your best to live as once the wind reaver dies it's smooth sailing. Prot paladin did gold dps trial. Really not that difficult. Pursuit of Justice, Divine Purpose, Execution Sentence, Seraphim. Glyph of Focused Shield, Double Jeopardy, Harsh Words (key). Seal of Truth. Make sure you're Word of Glorying offensively. Ret gear + unenchanted sword and board. Mecha-blast rockets suggested were quite helpful. That this achievement exists at all is telling me that it is in fact Blizzard who are doing it all very much wrong. They are essentially saying, yeah we know this isn't balanced (i.e., fair for your class/spec) but you have to do it all the same if you want to get into the random Heroic queue. Have a nice day (or week or two). Having now got through Proving Grounds on my arcane mage (thanks to a better-sighted ringer I put in my chair for the occasion. I am not ashamed of it, under the circumstances which Blizzard, not I, created), now doing WoD Heroics, I can assert that, at least in my case, Proving Grounds proved nothing. I hold my own in those dungeons and consistently maintain rotation of the (actually not so crummy anymore) arcane DPS, dodging DoTs, keeping adds off the healer, NOT pulling every damn trashmob by spamming AoE. I know how to dungeon-crawl and raid, but I am not so great at arcade games, which is all that Proving Grounds is in its current form and applicability (supposed) to determining one's worthiness to progress dungeon difficulties in the current endgame content. BULL%^&*. Blizzard, you are the ones doing it wrong, you morons! The level 100 version of this is You're Doing it Wrong, and then there is always the You're Really Doing It Wrong which is hard, hard. Check out Wowhead's Proving Grounds Strategy Guide, featuring details on each wave for Gold and Endless, a bestiary overview, and general tips for all roles and difficulties.